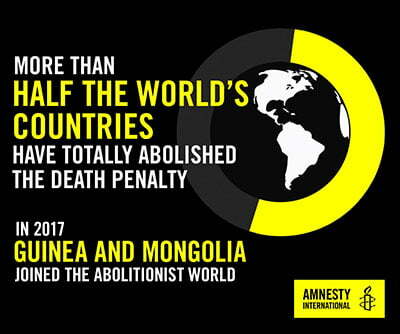 Amnesty International’s new report Death Sentences and Executions 2017 reveals a global trend away from the death penalty, after record-high peaks in recent years. However, the Asia-Pacific is still the region where the most countries applied the death penalty for drug-related offences. Here we give a snapshot of the death penalty around the world today. How widespread is the use of the death penalty? 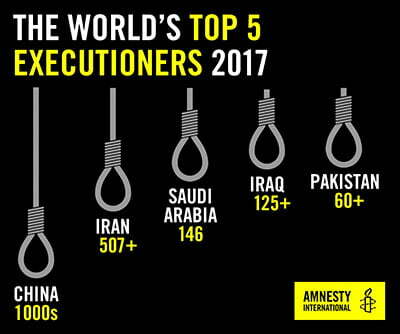 In 2017 most executions took place in China, Iran, Saudi Arabia, Iraq and Pakistan – in that order. Amnesty recorded at least 993 executions across 23 countries. But the real number of people executed could be much higher. There are no figures for China, for example, which is believed to execute more people than the rest of the world put together. Bahrain, Jordan, Kuwait and the United Arab Emirates (UAE) resumed executions in 2017. At least 93 executions in nine countries were known to have been carried out throughout the region in 2017 – down from at least 130 in 11 countries in 2016. The decrease was linked to a decline in Pakistan, where executions reduced by 31 per cent. Singapore doubled its number of executions (from four to eight) compared to 2016. All its executions were for drug-related offences. Eighteen countries across the region were known to have imposed death sentences, the same number as in 2016. However, Papua New Guinea did not impose any death sentences in 2017. And how many people are still on death row around the world? Amnesty International recorded at least 2,591 death sentences in 53 countries in 2017, a significant decrease from the record-high of 3,117 recorded in 2016. At least 21,919 people were known to be on death row at the end of 2017. Hoo Yew Wah is currently on death row in Malaysia. He grew up in a disadvantaged community and was locked up for having drugs on him at just 20 years old. He has spent 12 years in prison and understands how his past actions were wrong. He shouldn’t have to pay for his crime with his life. 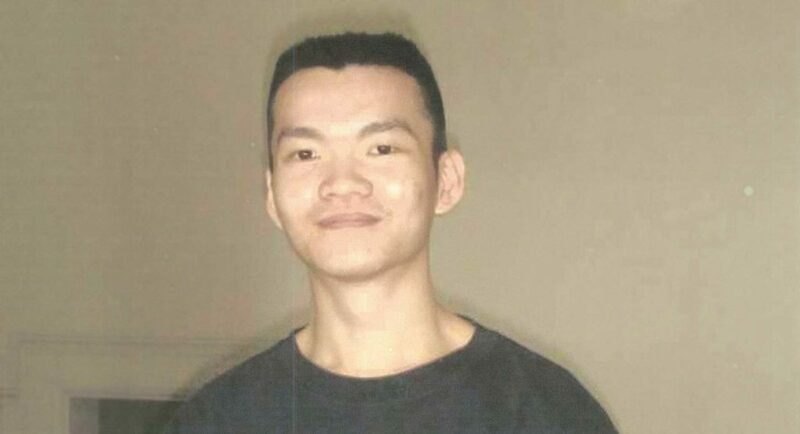 Please join thousands of Amnesty supporters calling for clemency for Hoo Yew Wah. Which crimes attracted the death penalty in 2017? Around the world, 15 countries imposed death sentences or executed people for drug-related offences in 2017. At the close of 2017, a total of 142 countries had ended the death penalty in law or practice, with 106 countries completely removing it from their law books. Globally, executions were down by four per cent from 2016 and by 39 per cent from 2015. While 2,591 death sentences in 53 countries (excluding China) were recorded in 2017, this was a significant decrease from the record high of 3,117 in 2016. As the third anniversary approaches of the tragic executions of Australians Andrew Chan and Myuran Sukumaran, there are some signs of progress in the Asia-Pacific. Indonesia carried out no executions in 2017, and reported slightly fewer death sentences being imposed, after carrying out four executions for drug-related offences in 2016. As the world pivots towards abolishing the death penalty, it is more urgent than ever that the Australian Government steps up to a leadership role and releases its death penalty strategy. “A world without the death penalty is possible, with these new figures showing 142 countries have ended the death penalty in law or practice. We have reached the tipping point: most countries won’t have a bar of this horrendous form of punishment, and those countries still executing are increasingly isolated,” said Rose Kulak, Death Penalty Campaigner at Amnesty International Australia. The Australian Government needs to show leadership in the Asia-Pacific, the region with the greatest number of countries – 10 out of 16 countries – resorting to the death penalty for drug offences. 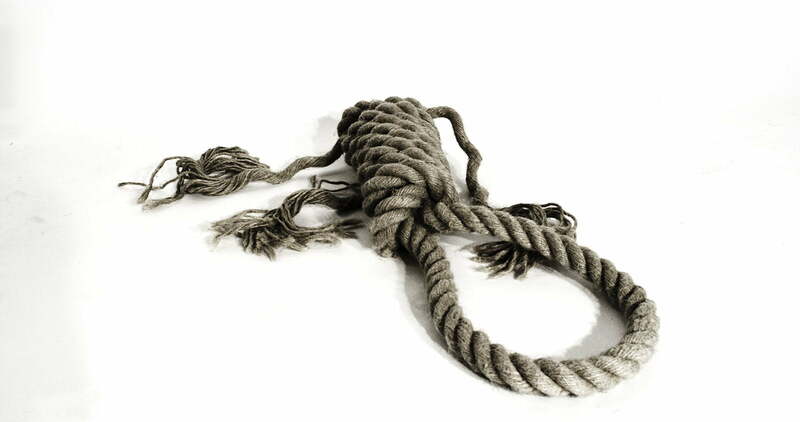 Find out more about Amnesty’s work on the death penalty.